GAS. If you’re on this website, chances are you already have pathological Gear Acquisition Syndrome. You know how it is: “My mixes/songs/pulling power will be so much better if I get blahdy-blah reverb.” So you fork out for it, maybe use it in a couple of tracks, then another company brings out one at twice the price and you think... No. Go back 53 words and a numeral from here and repeat until you know what I’m burbling on about. But I'm guessing you already do. The sad fact is that I can look over my shoulder and see two shelves full of virtual instrument and effects boxes, a slim-ish book and a couple of magazines with four-page articles on the art of music production. Having all that gear plus print-tutorial material is like sitting in a Ferrari with a disfluent driving instructor. What you need is hand-holding and guidance from someone who knows how to motor. ‘Ello Ken! 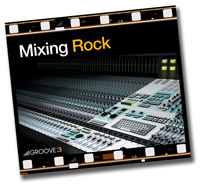 And a big ‘hi’ to your 37-tutorial Mixing Rock video package. Let me introduce my new best mate Kenny Gioia, a multi-platinum-credited music-production engineer who also has a large presence on discussion board gearslutz.com and a fair number of video training products over at pro-audio training outfit Groove 3 Inc. The package I'm focusing on here is Mixing Rock, available for viewing online (a 30-day pass is $18.99), as downloads for you to keep ($37.50) or as both downloads and on disc for the full whack of $49.99. Mixing Rock comprises six hours and 45 minutes of video training and straight away there’s an awful lot to like in this rockin’ round-up. I like the fact that Kenny appears to have a real-life job, working on productions that have been recorded well enough, but need an engineer’s magic. I also like the fact that he has made considerable effort to keep things DAW-agnostic. 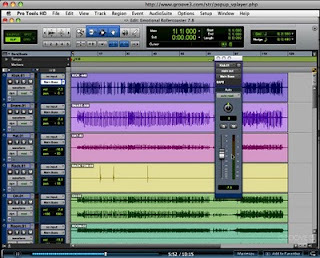 He uses Avid Pro Tools, but steers away from Pro Tools-only products that might otherwise have been deployed. I followed one of his lessons on Presonus Studio One with no problem, although one wee niggle I do have is that during the course of the tutorial, Ken hypnotised me into buying 112dB Redline Reverb and Cytomic The Glue, a virtual analog console buss compressor. After all, if they're good enough for Kenny... Damn the man for making me buy extremely good effects which have significantly improved my recorded material! (If GAS doesn’t get you one way, it'll get you another.) There is one important thing to say about all this: I made the decision to buy based on seeing how the tools are used in a real situation rather than from advertising, netsay or demo MP3s. The Glue, in particular, is one great product I had read about in passing, but I hadn't really grasped its potential. It takes a while before one dives into applying compressors, EQs, delays and the like. First you get to order and colour (sorry - ‘color’ for you Amerispellerz) tracks. It’s good to see the whole process detailed from someone who appears to know what he’s doing. The number of times I thought ‘Ohhh! Of course!’ about advice on the nuts and bolts of mixing - advice you would never find in a manual for one particular product. 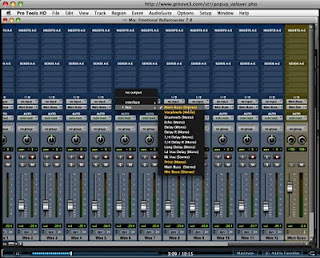 For example, I use Toontrack drum products and would slave over individual kicks, snares, etc while taking a look at the overhead and room channels without knowing why they were there. How misguided I was. With Ken’s material, we get down to the application of sends and inserts to channels pretty sharpish and I’d advise keeping a decent pair of headphones on hand to audition some of the examples. Many of the before-and-after sounds are subtle enough to demand close listening with either a pair of ready-trained ears, or the willingness to have them trained right in the lesson. This is where the video set really shines for me. I realised that I’d been using compressors as blunt instruments for making things louder, then hacking away at the sounds with EQ plug-ins like some demented comb-filter maniac. Oh, I’d read about how to use these effects, but it’s only when you see and hear an expert in action that you want to go back to all your old, highly traumatised tracks, offering cuddles and apologies if only their psychotherapist will lift the restraining order. Analogy time: If my productions were wooden tables in need of polish, then I've been throwing tins of staining wax at them so hard that they’re all dented and splotchy. Mr Gioia's tables, by comparison, have a lovely smooth and subtle sheen that really brings out the best in the wood. I saw some folk on gearslutz midly teasing him for speaking quickly. While it’s possible that an amount of time squeezing has been used to cram all the narrative in, it’s not uncomfortably rapid-fire. The chances are that Ken’s detractors just listen slowly. He has a voice that’s both non-attitudinal and no-nonsense, he doesn't try to be wacky and become over enthusiastic, and he doesn't get in the way of the considerable amount of information imparted. The individual videos range from about five to 25 minutes in duration, which means you won't get fatigued too quickly. Naturally, someone with less experience will glean more, but I’m sure that even an adept at the mixing desk will get much from the assembled material. Unless there’s nothing more you can learn about mixing. Yeah, right. I finished the last few videos as quickly as I could, reason being that I was champing at the bit to go and remix some old tunes and/or record some new ones, which is recommendation in itself. To sum up, I’m now armed with the knowledge of a pro recording engineer and a pair of ears that have a much better idea of what they’re listening for. 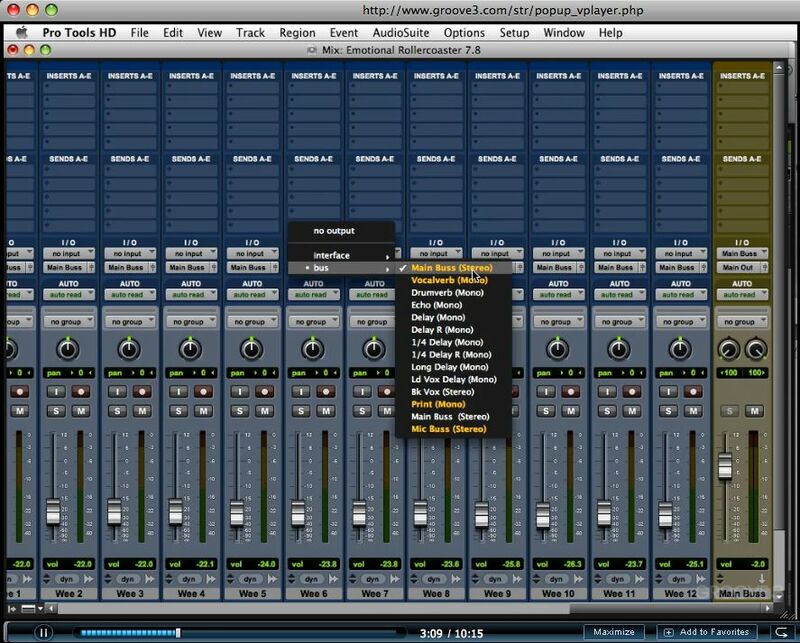 Some of Ken’s practices I’d already been aware of from magazine articles, books and so forth, but it’s so much clearer when you see them being performed on your Mac or PC monitor via Groove 3’s slick video player. For me, video is the best medium for learning about things of an audio/visual nature. Mixing Rock is excellent stuff and I’d say rather than forking out $99 for that latest compressor plug-in or whatever, you’d do better to splash half the amount (less at the moment because it’s on special offer) for this package. It’ll make your mixes rock out in fine style and induce therapeutic GAS, rather than the nose-wrinkling guff that drives people out of the control room.